Nature is brilliant and creative. Often it creates something that even in the wildest dreams one cannot imagine. The perfect proof of this statement is the myriad of beautiful natural sites around the world. This is also the impressive rock formation Bastei Bridge (often mentioned also as fortification), which rises above the Elbe River in Germany. Adding a detailed man’s work to the site itself, you get almost the perfection itself. 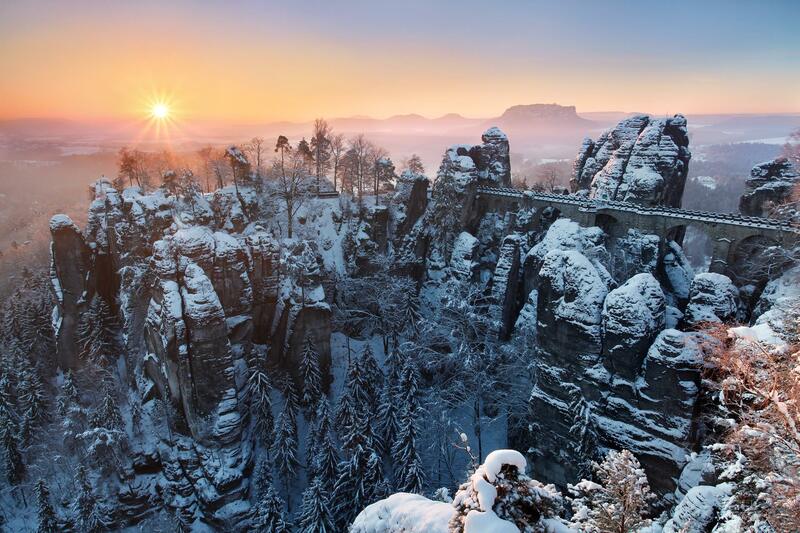 Bastei Bridge is a breathtaking rock formation in Germany, created by water erosion for over a million years ago. It rises to a height of 305 meters (1,000 feet) and is considered to be the majestic throne above the Elbe River. Looking at the photos, it is definitely clear why the site is particularly attractive to tourists. This fact was quickly realized by the locals, and already in the first half of the 19th century, specifically in 1824, they built a wooden bridge that connects several rocks from the formation. Visitors enjoyed a unique experience. Tourists had been coming more and more, so appropriate actions were taken. In 1851 the bridge was replaced by the current, sandstone one, mainly for reasons of stability and security. 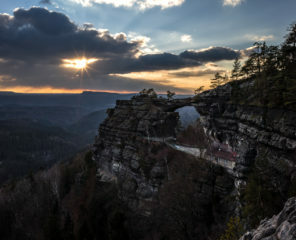 Thus, the tourist dominance of the Saxon Switzerland region was created, which has kept its popularity by now. 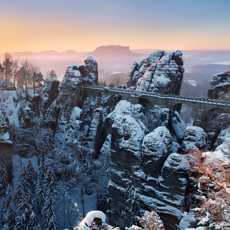 The Bastei Rock Bridge is a magic place that attracts people magnetically. Green hills, hiking trails, mountaineering opportunity, the river flowing through the countryside. Views and options like an adventure movie. What more can one wish for? Therefore, there is no need to look long for reasons to visit this site. The Germans are fully aware of the potential that this rock bridge has to offer, so they also adjusted local services and transport. Let’s have a look together. 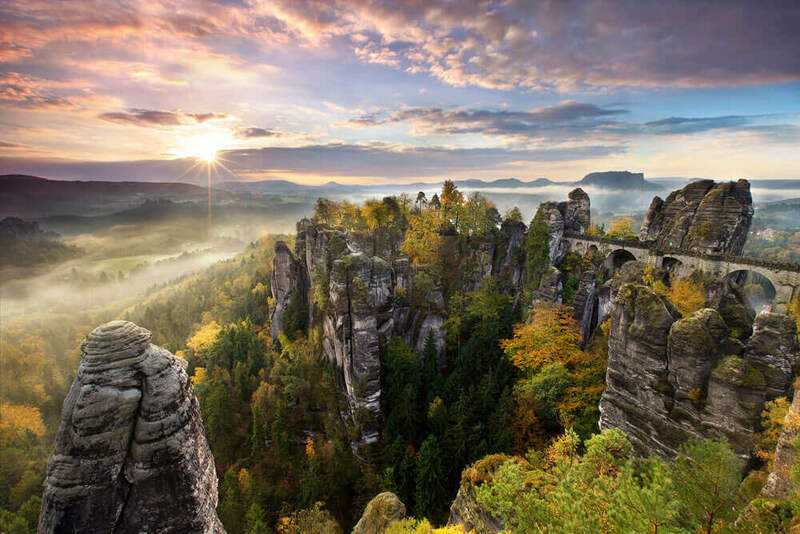 The name Saxon Switzerland can be confusing because the area is nowhere near the border with that country. 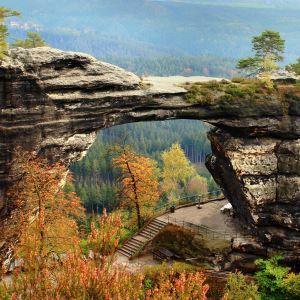 A closer look on the map shows that the bridge and the Bastei rock formation lie approximately 40 kilometers east of Dresden in Germany, the capital of the Land of Saxony. The distance is roughly the same from the Czech border. These names have been given to the regions due to the picturesque local nature. 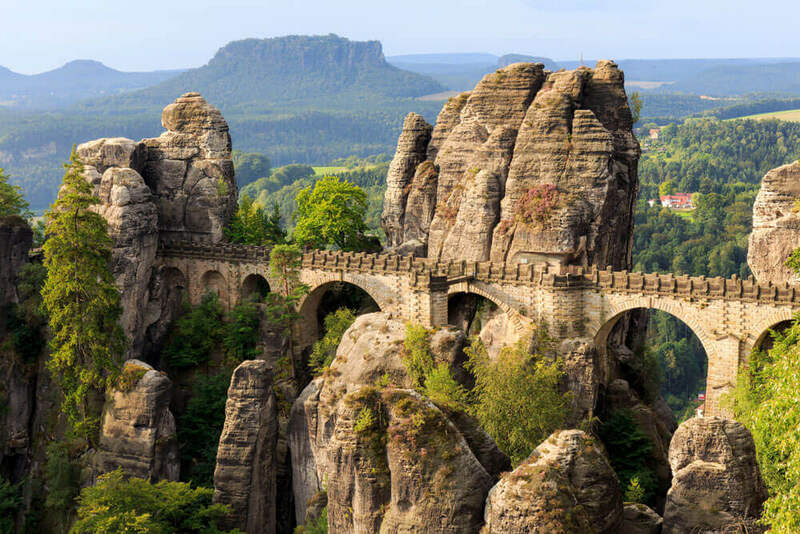 And the nearby surrounding area of Bastei Bridge is equally breathtaking. Who was not there, perhaps never understands. The most convenient way how to get to the Bastei Bridge is by car. Many visitors coming from Prague use this option as the journey takes only 2 – 2,5 hours (depends on your departing point in Prague). We recommend turning on the GPS navigation and follow it until you reach the car parking nearby. You can also use a cross-border bus line number 217 Tisá – Sněžník – Rosenthal – Königstein. Be aware that this line is in service only during weekends and public holidays. Another option is a bus line number 434 from Děčín or special national park train connection. Děčín has great bus and train connection with Prague, which solves the problem if you cannot travel by car. 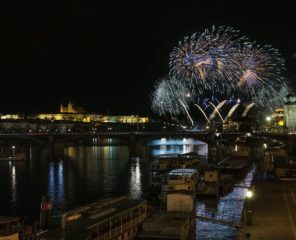 A time-saving solution is an organized day tour from Prague. You don’t have to plan anything, just sign up and besides Bastei Bridge see also some more from Bohemian Switzerland. If you are coming from Germany, the easiest to reach this destination is from Dresden. During the day, a train departs from there around every half hour, which also stops in the nearby village of Rathen. Here you get off and change for a boat on the Elbe. It takes you a certain distance along the water surface followed by a bit of walking via the marked hiking trail, and you reach the destination. Your journey is complete in less than an hour of your time. It is not challenging hiking – all you need is quality shoes, bottle of water and possibly a map or GPS navigation. However, you have marks and signs everywhere, so it’s difficult to be lost there. When to visit and how much it costs? Surprisingly, access to the rock bridge is free, so you don’t need to pay fees or tickets. And this applies throughout the year, whether it is winter and freezing outside or the sun shines. Bastei is always open to the public. It has its charm in all seasons of the year, only by repeated visit you would be able to find what you like the most. What is the ideal time to visit? The core of all tourists come here during the day. So if you want to avoid crowds, come early in the morning or early evening. However, keep in mind that the sunset is beautiful and even larger groups of visitors can be met here on this specific day time. If you arrived by car, you only pay for parking. Parking for over two hours, you pay about € 5, which is not bad at all. Especially considering the beautiful environment in which you find yourself embraced in. At both sides of the border crossing the national park, you can find great restaurants or local pubs with traditional food and beer which is a significant part of German and also Czech food culture. The rock bridge has a panoramic view restaurant serving standard Saxon food and drinks. It is open daily from 10 am to 10.30 pm (from Easter to late October), or until 5pm (from November to Easter). Being in a tourist area, be ready to pay for your meal extra. Visiting Bastei Bridge is a great day trip. However, if you decide to stay overnight, you can choose from different options that suit the best to your needs. If you like to enjoy an active day outside and then relax in wellness, some of the popular wellness hotels such as Lužan or Ostrov might be what you seek. One night is approximately 80 €. A good choice is also pensions where to expect to pay from 40 € per night. The panoramic restaurant mentioned above is part of the Berghotel Bastei complex, which offers accommodation and other services such as a sauna and bowling. One night costs about 100 € (breakfast included). 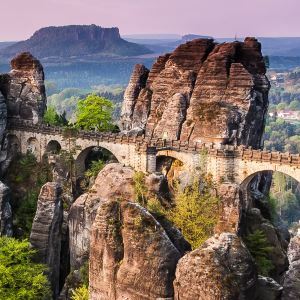 If you are on a longer trip and Bastei Bridge is one of the stops, camping sites in the surrounding villages can be a good fit for you. National park and surrounding nature is a great place for other activities besides hiking. 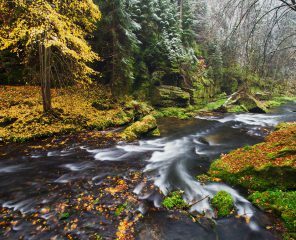 Rent a bicycle and bike along the beauty of Bohemian Switzerland. 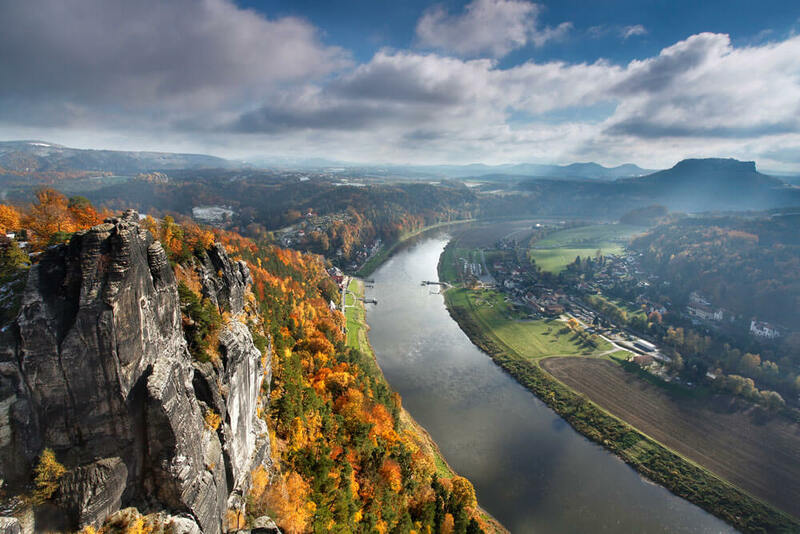 For adventurous travelers, we recommend guided rock climbing or rafting on the Elbe river.